Revolutionary new bow from Ulstein versus traditional flared monohull bow. Ulstein claims significant reductions in vibration and noise and less pounding than with conventional bow. From the video, it's hard to tell. One would have to actually be on the vessel. Also, the conventional bow in the video is considerably smaller than the X-bow. Although I'm sure both vessels are roughly the same length and breadth, comparisons like this can be misleading. For one thing, you can tell that if a wave were tall enough there's a chance it could climb the X-bow unimpeded to the bridge windows, whereas with a flared conventional hull, the curve of the flare serves to peel the power of the wave in a way that protects the bridge. By the same token, excessive flare can be a impediment to vessel buoyancy. If a vessel is driven bow down by the force of the sea, the flatter and greater surface area of the forward deck created by the flare makes it harder for the bow to recover. In the X-bow, you can see how the bow would pop up quickly if ever it were driven under by the force of its own motion and the sea. Funny thing about vessel designs. What makes a vessel more stable and more comfortable in certain pre-critical conditions makes the same vessel less capable when the seas exceed a given state. You would think that if the vessel were built large enough, as appears to be the case with the bow on the Ulstein service or utility vessel, nothing much would challenge it. But only time and mother nature know for sure. I mentioned this movie before (see Clyde Puffers below) but couldn't post a review until today. Suffice it to say, it's a gem. Reminds me, in spirit, of another movie I reviewed here, I Know Where I'm Going, similar in that it also involves a fish-out-of-water traveling to far off locales and meeting richly engrossing characters of the Scottish seacoast. Although, in The Maggie, one could say the main character isn't of flesh and blood but rather riveted steel and coal. The stage is set from the start when the boat enters Glasgow and the two harbor masters make a rather disparaging remark about both vessel and crew. From that moment on the Maggie is on a journey to save herself from the scrap yard. Fortunately for the tired old gal, she has a dedicated, tenacious captain and a crew who love her and will do anything to save her. There are some ethical issues regarding the captain's methods of obtaining the cargo that will ultimately pay the Maggie's trip up the ways to repair her thinning plates and tired old two-cylinder steam engine. But who in their right frame of mind would fault a desperate man for keeping his mouth shut and choosing not to sink his only chance of survival and salvation? On the other hand, Captain MacTaggart must be more than just mum in order to save his boat. He must be wily as a fox. And wily he is as the story unfolds, taking us from Scottish port to Scottish port, through the Western isles and Hebrides, through the canals, onto the flats, hitherto and yonder; MacTaggart and the crew of the Maggie doing their best to outsmart and outrun the man who hired them, just so they can get the job done and get their three hundred pounds. As I mentioned earlier, the Clyde Puffers attained mythical status thanks to the serialized musings of author Neil Munroe. I have Munroe's book as well and started reading it a few days ago. 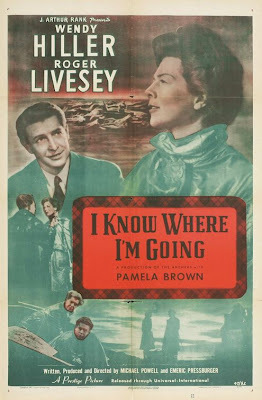 Although there is no reference in the movie to Munroe's fictional captain (Para Handy) or his boat the Vital Spark, this film does them both justice. In many ways it's much better than the BBC TV adaptations, which were, as I'm told by a very reliable source, full of lager and whiskey mayhem. The Maggie: Four and a half out of five stars. Today's wires are following a story out of Miami Beach about four missing crew members from the charter boat, Joe Cool, shown above. The four missing crew are the captain and his wife and two young men, first and second mates. The boat, in disarray but apparently not damaged, was found adrift 100 miles off the coast of Cuba; the two young men who chartered her, the only other two on the boat, were pulled from one of the vessel's two life raft, found about twelve miles from where the Joe Cool was found. FBI and other investigators are questioning the two men recovered from the life raft. One of the charterers, a US Army deserter, is also a fugitive and a suspect in a $92,000 Wal-Mart heist. The captain of the vessel supposedly had both a shotgun and a pistol on the boat. Add to this the fact that he had with him his wife and the two male crew members, all experienced big game charter fishermen, and you have to consider them as not your typical victims. How can two ocean going neophytes, one of them 19 years old, get the better of four experienced, able bodied and armed mariners? One thing we know for sure is that nobody in their right mind leaves a perfectly good boat to get into a tiny inflatable life raft, or worse. In fact, as of 17:00 EST, it's looking more and more like a criminal act on the part of these two scumbags. All the more reason for the Coast Guard and FBI to show them no mercy. If I was interrogating them, I'd chum up some sharks and dangle their sorry asses in the water until they talked. I suppose that's not the American way. However, it's plainly obvious they know more than they're saying. If the crew of the Joe Cool are in the water somewhere in the Florida Straights, treading water, waiting and praying for a rescue, and these two assholes know where they are, then someone should make them talk, by whatever means necessary. Sounds uncivilized, unless it's your father or your mother or one of your own boys you're trying to save. This tragic crime is shaping up in a way that reminds us of just how difficult it is to fight the war on terror. We're up against people (and I use that term loosely) who have no moral or ethical standards, who will say and do anything to achieve their goal, whether it's pirating a 47' sport fishermen or instilling Allah's will on the so-called heretics of the world. It's also a lesson to charter boat owners and captains everywhere. Never take anything for granted. Be prepared to defend your boat, crew and passengers by any and all means necessary, including acts of violence. I knocked out a passenger and tied him in a bunk once, and I have threatened other unruly passengers with the same. I also know one captain who had to lock himself in the wheelhouse with a shotgun in order to keep his rowdy charter party from taking over the boat. Me and Moonfish at the Public Landing at Pulpit Harbor. Not much water here at low tide so an extended stay would not be recommended for vessels drawing more than 3 or 4'. At half tide, as indicated on my tide clock, the depth sounder indicated 8' of water. Given the location of the transducer I would estimate a mean low water depth at the dock of approximately 4-1/2'. We found this guy sitting in what I believe is an abandoned osprey nest on Pulpit Rock at the entrance to Pulpit Harbor on Sunday. Pulpit Harbor is on the north shore of North Haven Island in the middle of Maine's Penobscot Bay. I'm not sure many of you will know what a Clyde Puffer is. Perhaps if I mention Para Handy and The Vital Spark or The Maggie. Ring a bell? Maybe a ship's bell? 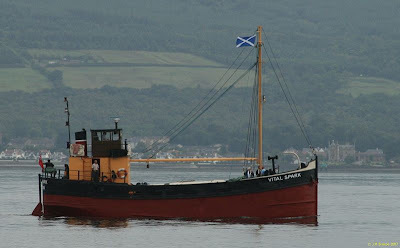 Honestly, I didn't know what a Clyde Puffer was either until I started looking for self-propelled mooring barges. That led me to canal barges, which led me to flat bottom steamers, which led me to Scottish coasting vessels called Clyde Puffers. These were common traders around the turn of the 19th Century, typically used to carry cargo around the west coast of Scotland and the Hebrides Islands. What's interesting here is that author Neil Munroe (not the same one who wrote Robocop) gave these vessels and their crews mythical status when he penned stories of the fictional Vital Spark and her rascally captain Para Handy. These stories eventually led to a BBC Series and a movie called The Maggie, which was written by screenwriter William Rose, who would go on to write It's a Mad, Mad, Mad, Mad, World and the Oscar winning Guess Who's Coming to Dinner. Talk about getting off track. Here I was trying to find a small steel boat for dock and mooring work and I ended up looking for DVDs of old BBC TV shows. Here's a film I would have never ventured to watch had I not come across it by accident on Turner Classic Movies. Joan has these directions to the island on which this guy has planned to marry her. She has to take the train from London to East Bumshoe, then another train from Bumshoe to Overloafen, a bus from Overloafen to Pudgydubby, a cab from Pudgyduddy to Shaddycrack, the ferry from there to some other weirdly named town, then the water taxi to yet another Scottish backwater, and finally a private skiff to the island. Unfortunately, when she gets there, it's thick of fog. Swirling, smoky, impenetrable fog. Fog like you won't believe, unless you live in Scotland or Great Britain or Maine, like I do. Or you own a Hollywood fog machine, or work in a Russian spa, or live next door to Sherlock Holmes. You get the point. So she can't get to the island. She has to stay at someone's house with a bunch of other people who are similarly stuck. At this point, we're only about five minutes into the film, which is just more of this movie's magic, because it's here she's dealt the classic "Call to Adventure" of the hero's journey. She meets a man, and not the one she's supposed to marry. The man is Torquil Macneil, played by Roger Livesey; he wears a kilt and speaks in a heavy Scottish brogue, and although he's not exactly the most handsome leading man you ever saw, he does wear a kilt and speak in a heavy Scottish brogue, which makes him, apparently, very hot. Don't get me wrong, he's always the perfect gentleman. It's 1945 for God's sake. Later that day, feeling rather threatened by this charming kilt-wearing Scotsman, she tries once again to get the boat to the island. She's told it's way to foggy but as soon as the wind comes around northwest, the fog will lift and they'll be able to go. That night, Joan, while lying in her bed at the Inn, prays for wind from the northwest. In the morning Joan wakes to find her prayers answered. The fog has cleared. Unfortunately, it's because of a full blown northwest gale, which ends up sticking around for more than a week. She never makes it to the island. This special gem of a movie is the product of one of the most creative collaborations in movie history, that of Michael Powell and Emeric Pressburger. They had a gift for storytelling that is almost gone. Very often when you see a film today you're struck by inconsistencies, failures of logic, plot holes, gimmicks, etc. Or you're faced with a movie that just doesn't come together. Not the case with Powell and Pressburger films. Their movies have perfect structure; they engage you, keep moving toward a goal and wrap up all neat and tidy. If you ever see this one on the video rental shelf, grab it and take it home. I guarantee you won't be disappointed, especially if you're trying to score some points in the romance game. I just finished Land of Mist and Snow by Debra Doyle and James Macdonald. This an alternate history fantasy about two civil war era ships doing battle on the high seas. The twist here is that the souls of these ships are captured elemental spirits. It's an interesting premise, one that many professional, as well as recreational mariners, will appreciate; all vessels are viewed by their crews as near-living things, if not actually living things, and all crews consort with seaborne superstitions and myth. The story begins as Lieutenant Nevis receives word he's getting the detachment of his dreams, the opportunity to leave his desk job at the War Department on Whitehall Street in New York to finally join the fight in the sailing Navy. His first assignment: to inspect and take possession of a dozen ten inch Rodman guns at the Naval Arsenal in Watervliet. Your first inkling of the story's supernatural slant comes at the end of the first chapter, when Nevis learns the guns and cannon balls are made of pure virgin brass, and that they are destined for an experimental ship of war being constructed on the ice at Thule. For me, that was the hook. The vessel was being built on the ice and not a railway at a shipyard because, for reasons that become clear later on, the ship could not come in contact with land. Doyle and Macdonald have constructed a logical and very entertaining supernatural story pitting good against evil, weaving in various aspects of reality and staying faithful to the prose and authenticity of the era. I was particularly impressed with their nautical detail and accuracy. The story is told in log book or diary form, with first person entries from the various characters. If the overall effort has any fault, it lies here, as the entries don't really allow for much individuation of character. This can be a huge stumbling block for avid readers of contemporary fiction, i.e. people who prefer third person narratives and/or a more dialog driven format.